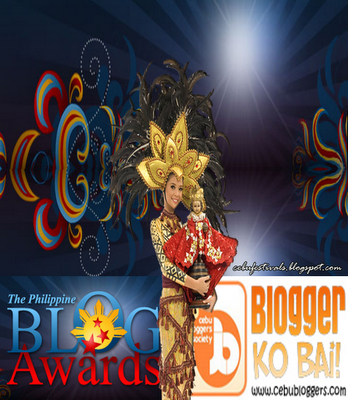 The Philippine Blog Awards (Visayas) 2009 is approaching. It’s time to cast my vote and let the world knows which Visayan blog must stand out. I am choosing the Cebu Bloggers Society, which aims to promote Cebu through blogs. When I started being a pro-blogger, I realized the need of joining a local blogging community. Please don’t take “pro-blogger” literally. Me, neither, is not really sure if I deserve to be called such… Anyway, since I officially joined CBS- I was able to join different events it has organized. From Tech events, political meet-ups, Digital Filipino Club event, the Maribago Bluewater visit, and exploring the hidden paradise in the South- were just among the activities I joined. And all of these were promoted through CBS. The upcoming PBA 2009 (Visayas) would also be the first nationwide blog awards I will be joining. We, Filipino bloggers, would have to rant out what we think deserves most as the best Visayan blog. KUDOS CBS! To get more updates about PBA 2009 – Visayas, you can subscribe either by E-mail or by RSS Feeds.